On 12.5.12 all roads will lead to London where over 3000 people will be part of huge indoor electronic music festival, taking place at the impressive Proud2 in London. SuperVision is an indoor festival event that promises to go way beyond your usual club night! With more entertainment, creative production and plenty of different areas to dance and chill out, and of course only the finest electronic dance music. 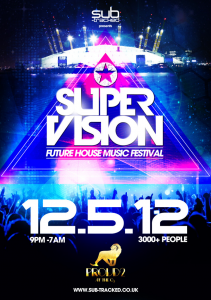 The theme will be Futuristic Fantasy with different DJs and different vibes in each room. There will be 4 DJ areas on the night including Main Stage, Peninsula Room, VIP area and a 700 capacity outdoor area, all adorned with huge LED screens, pyrotechnics, ice cannons and other entertainers and acts throughout the night plus so much more, all on hand to make sure this is a sensory experience like few others. Plus over 20 more DJs spinning through the night still to be confirmed. Plain and Simple are giving away 6Pairs of Tickets to this Huge event! To enter simply tell us: What dis Proud2 used to be called? Over 18s – ID will be required. Katy B to play midnight slot at Togethers NYE party.